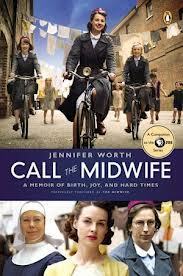 Premiering September 30, 2012, PBS will air Call the Midwife, a six-episode series produced by Sam Mendes (American Beauty) and the BBC, about a group of midwives based in East London in the 1950s. The series was BBC One’s highest rated show of all time when it aired in the UK earlier this year and will air directly before the new season of Upstairs, Downstairs. Fans of Downton Abbey and Mad Men have something to look forward to this September with this candid look at post-war London. In the 1950s, twenty-two-year-old Jenny Lee leaves her comfortable home to move into a convent and become a midwife in London's East End slums. While delivering babies all over the city, Jenny encounters a colorful cast of women—from the plucky, warm-hearted nuns with whom she lives, to the woman with twenty-four children who can't speak English, to the prostitutes of the city’s seedier side. Based on Jennifer Worth'’ bestselling memoirs and already a bigger hit than Downton Abbey in the U.K., Call the Midwife promises to delight millions of viewers in the U.S. Okay you guys, I AM SO EXCITED FOR THIS SHOW. I read this book a couple of years ago and LOVED it and I gave it to my sister and she LOVED it and she gave it to her friends and they LOVED it, too. It's just one of the very best memoirs I've ever read and now it's a TV show!!! And apparently the TV show is wonderful, too! I gave it five stars and I said, "This book is a collection of some of the most heart-wrenching stories you will read and some of the most beautiful and hopeful stories of the resiliency of the human spirit. It's also a journey for Jennifer Worth as she opens her skeptical heart to embrace life and understand faith. I loved it." Omg just reading my review again makes me want to read the book ALL OVER AGAIN. But anyway! If you are in the United States you have a chance to win this book! Just fill out the form below. I will choose a winner Sunday September 23rd and notify them via email. Also! Watch the trailer. Watch the show.